this concept plain. The last day is in fact the millennial reign of Christ Jesus. with Christ a thousand years. things continue as they were from the beginning of the creation. earth also and the works that are therein shall be burned up. resurrection as promised in the scriptures. nor by letter as from us, as that the day of Christ is at hand. coming. But this day also concerns the wrath of God. believe (because our testimony among you was believed) in that day. the following verses about this punishment. face the earth and the heaven fled away; and there was found no place for them. those things which were written in the books, according to their works. dead which were in them: and they were judged every man according to their works. man according as his work shall be. life, and may enter in through the gates into the city. idolaters, and whosoever loveth and maketh a lie. root and the offspring of David, and the bright and morning star. death.15. And whosoever was not found written in the book of life was cast into the lake of fire. revealed; and hid, that shall not be known. preach ye upon the housetops. him which is able to destroy both soul and body in hell. For those outside it if full of wrath :So … We can see that the “day of the Lord is bothone of peace for believers and woe for those who are judged. It is a true day of wrath. the Almighty shall it come. might be taken away from among you. saved in the day of the Lord Jesus. had our conversation in the world, and more abundantly to you-ward. ours in the day of the Lord Jesus. reflected in that physical destruction is the second death.! event. He speaks this way because both happen in the “day of the Lord”. one that shall be found written in the book. turn many to righteousness as the stars for ever and ever. and believeth on him, may have everlasting life: and I will raise him up at the last day. John 11: 23. Jesus saith unto her, Thy brother shall rise again. in his people and to punish the wicked with destruction and the second death. store, reserved unto fire against the day of judgment and perdition of ungodly men. being on fire shall be dissolved, and the elements shall melt with fervent heat? found of him in peace, without spot, and blameless. posed..If the “day of the Lord” is a thousand years..How are the “last days“ defined?. That is dealt with in the next section. How long is the “Last Day”? What starts the “Day of the Lord”? Discuss this with the class. How long is a day with God? When did Jesus say his followers would be resurrected? three days, or “last days” are defined by Jesus himself and started at his first coming. days he did rise from the grave as he foretold on the morning of the third day. rest the seventh day from all his works. as a thousand years, and a thousand years as one day. day..the day of the Lord. temple of God is holy, which temple ye are. believeth on him, may have everlasting life: and I will raise him up at the last day. himself defined the “last days”. the Lamb: 17 For the great day of his wrath is come; and who shall be able to stand? and we are on the verge of the third day or better known as the “Day of the Lord”. The last days and their biblical contest are now made clear. How many total years are allotted for creation? 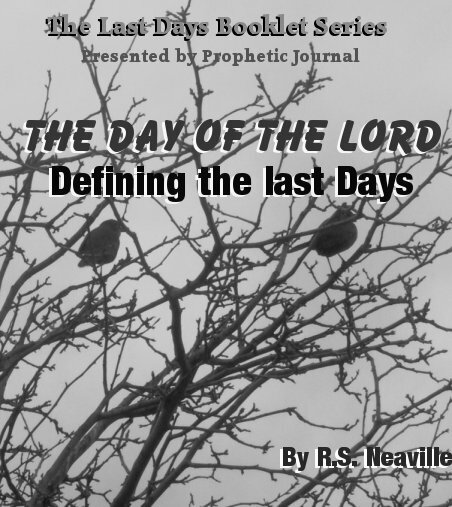 What two scriptural facts reveal to us the definition of the “last days”? What “day’ in this context did Jesus first come? How many days are left after Jesus death and resurrection? Discuss this with the class. What proof did the Apostle Peter offer that the last days had begun?